The men and women carrying Pulaskis, shovels, and back pack pumps into burning forests form the backbone of British Columbia’s Wildland firefighting efforts. Many First Nations communities provide skilled firefighters and Salmon Arm is no exception. Local Fire Warden Jake Jacobson has been hiring First Nations firefighters since 1986. He doesn’t have a noble, reverse discrimination hiring policy, he just looks for hard working individuals that he can depend on. By selectively rehiring only the best workers over the years, Jacobson has ended up almost exclusively with crews from local bands. As they gained experience, many became crew supervisors. 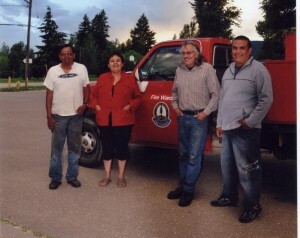 Adams Lake Indian Band members Linda Gaze, Bobby Kenoras, and Brian Johnny were all members of Jacobson’s team. The three gathered for an interview to talk about the Silver Creek Fire of 1998. They all agreed that when the fire was on both sides of the Salmon Valley it felt like being under a jet airplane that was flying too close to the ground. There was little air as the fire sucked away the oxygen. When asked, why they go back every year when the pay is low, and the work is hard and ugly, the three were quick to reply. Brian Johnny says he liked the thrill, the good memories of fire fighting, being in charge of the fire crew, and making decisions. Linda Gaze liked the change and being away from her regular routine. Bobby Kenoras liked the challenge of fighting different fires and using different techniques. They did the job well, took pride in the accomplishment, and enjoyed a sense of independence and control over their work environment. To qualify as a Wildland firefighter, candidates must take and pass a two-day course and take an annual safety refresher course. Radio amateurs are always willing to assist in times of emergency. 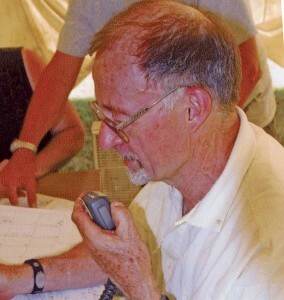 In 1998 the Shuswap Amateur Radio Club, at the request of Shuswap Emergency Program coordinator Gordon Pelletier, assisted during the entire 16-day activation of the Emergency Operations Centre. They helped set up the Emergency Operations Centre dedicated phone lines. They helped set up the Public-Information Phone Lines and took shifts with other volunteers to handle inquiries from the general public. Cell phones were brought in to the EOC from various suppliers. The Radio Amateurs were tasked with distributing these phones to the required agencies, including the Canadian Military, keeping the phones charged, and monitoring this inventory. Amateur Radio communications were established between the Salmon Arm Emergency Operations Centre and the Provincial Emergency Operations Centre in Kamloops. This link was tested hourly as a backup in case of phone failure. 3. Radio communication has changed since 1998. Gord Stewart is pictured keeping the people driving heavy equipment organized. 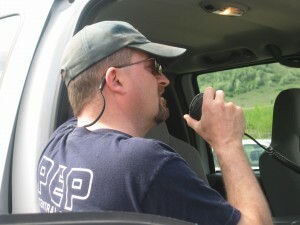 During the evacuation, radio amateurs, one per car, assisted the Search and Rescue volunteers with communications and local knowledge in the distribution of Evacuation Orders. Also during the evacuation, a separate Amateur Radio Station was set up in the District of Salmon Arm office with both VHF and shortwave-radio capability, courtesy at Al Marr VE7CAL. Radio amateurs were also instructed in the use of the satellite phones should that become necessary. Finally, they assisted in using the early digital cameras to provide an internet image of the Emergency Operations Centre Status Board to be sent along with the Daily Report to the Provincial Emergency Operations Centre in Kamloops. 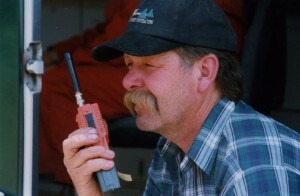 Although communications modes have vastly improved since 1998, there are still a number of amateur radio volunteers who are associated with the Shuswap Emergency Program in various capacities. 4. Search and Rescue’s Don Blakely was involved in the evacuation. Vernon Search and Rescue had been tasked to set-up and run a Staging Area for the SAR Units that were responding to the Salmon Arm firestorm. They were being tasked to conduct evacuations, traffic control, and man roadblocks/security perimeter. Pete Wise and I had initially been commanding this function for VSAR. SAR was actually the second largest agency on the ground. The day of the mass takeoff was one of the most unique and exciting experiences of my life. I can’t think of anything equivalent in modern life except perhaps the massed bomber streams of World War II taking off to bomb Germany. It was a unique event and a deeply moving experience. I will never forget those moments.